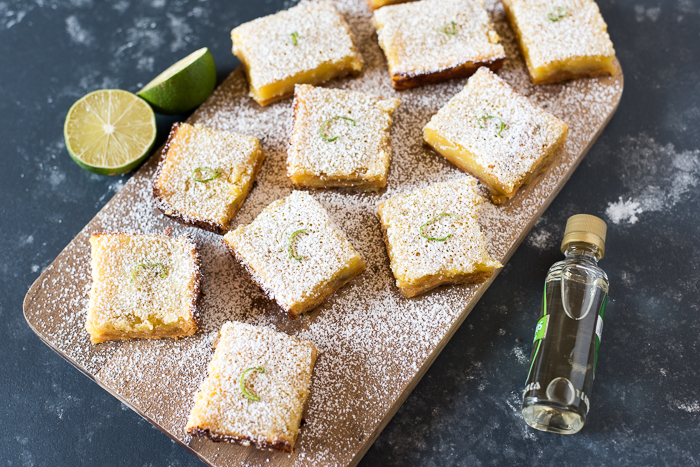 Tequila-Lime Bars - A Smart Summer Treat w Flatout® Flatbreads! 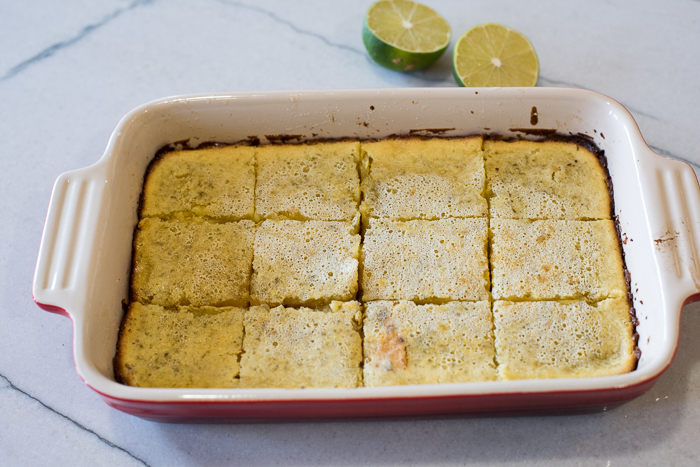 Tequila-Lime is a flavor combination that stands the test of time. Instantly, margaritas come to mind, but tequila-lime has made quite a name for itself too by way of char-broiled chicken and even burgers. 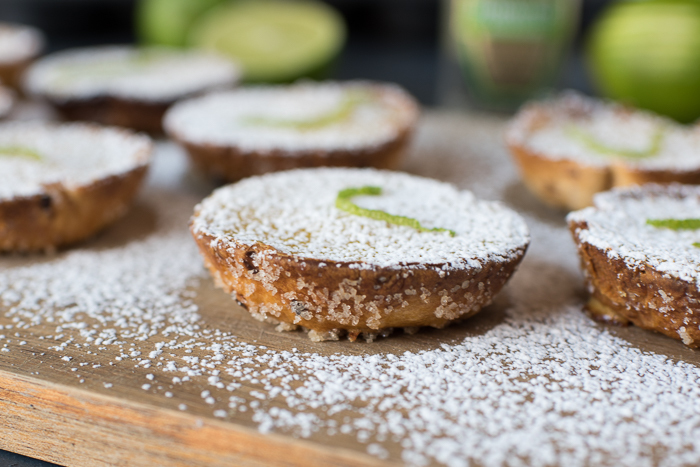 My passion is taking a classic flavor combination, and finding other ways to apply it to food. 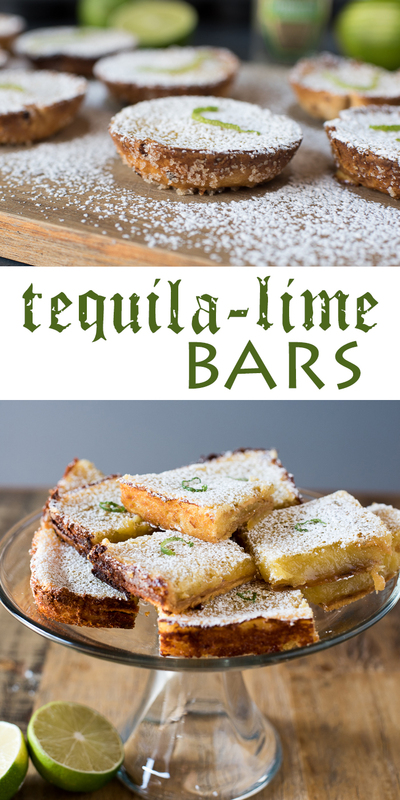 Tequila-lime bars instantly came to mind, as a bright summery dessert, and they SLAY! 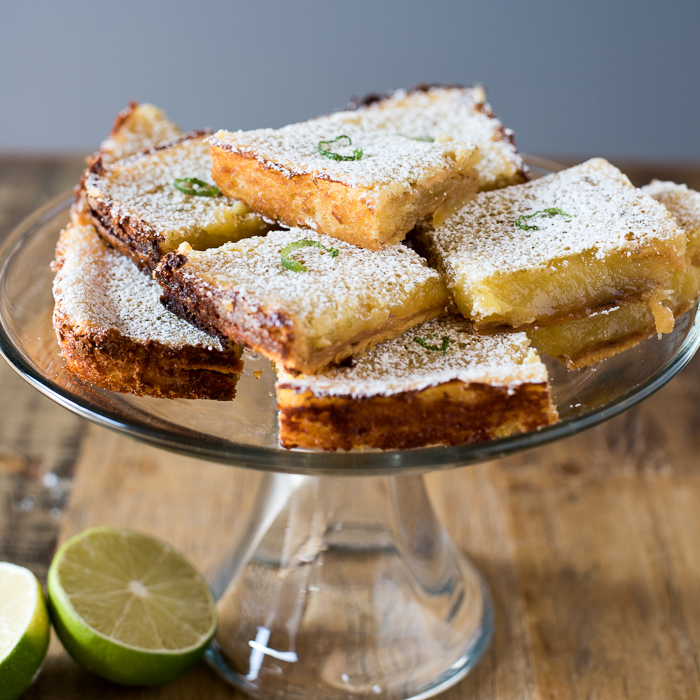 I wanted to cut the calories somewhere in these delightful, crazy-tarty tequila-lime bars because it is summer, and every calorie counts. I’ve been counting my own calories for a good month, and sometimes I need to get creative when I want something decadent. The Flatout® Flatbreads were a perfect choice for a healthier crust alternative with less calories, less carbs, less TIME, not to mention are lower in fat, and a good source of fiber. Winning all around. 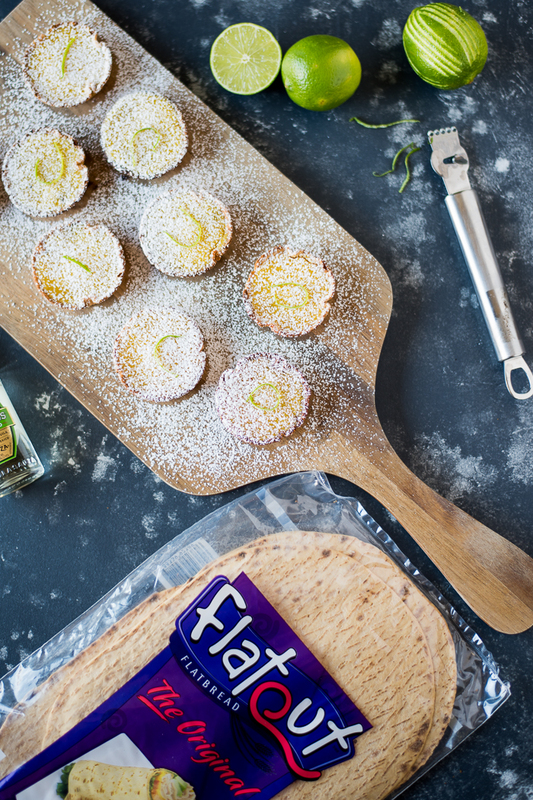 Enter Flatout® Flatbreads. They are the perfect blank canvas for these healthier bars, and replacing the shortbread crust in a traditional bar recipe with them made perfect sense. 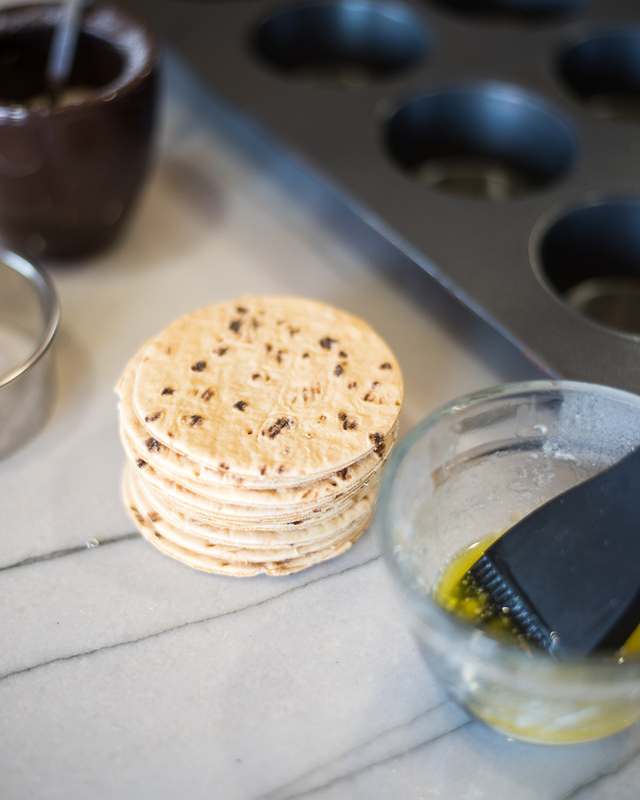 Butter up your pan, and cut up the Flatbreads to fit. Crust: done! 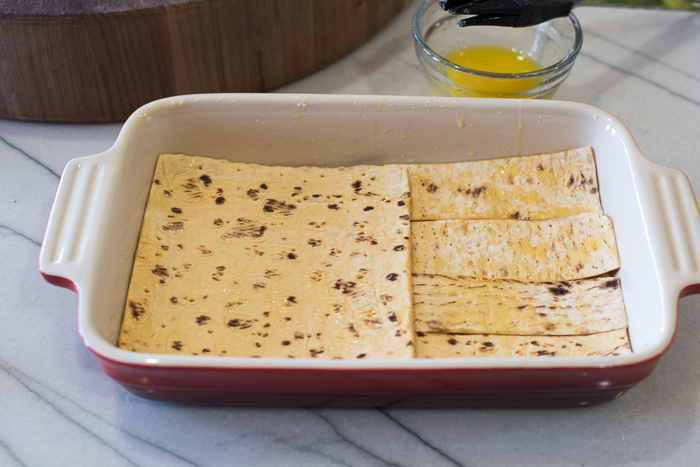 Baking the buttered Flatbreads in the baking dish first, crisps them up so they don’t get soggy or chewy after adding in the filling. 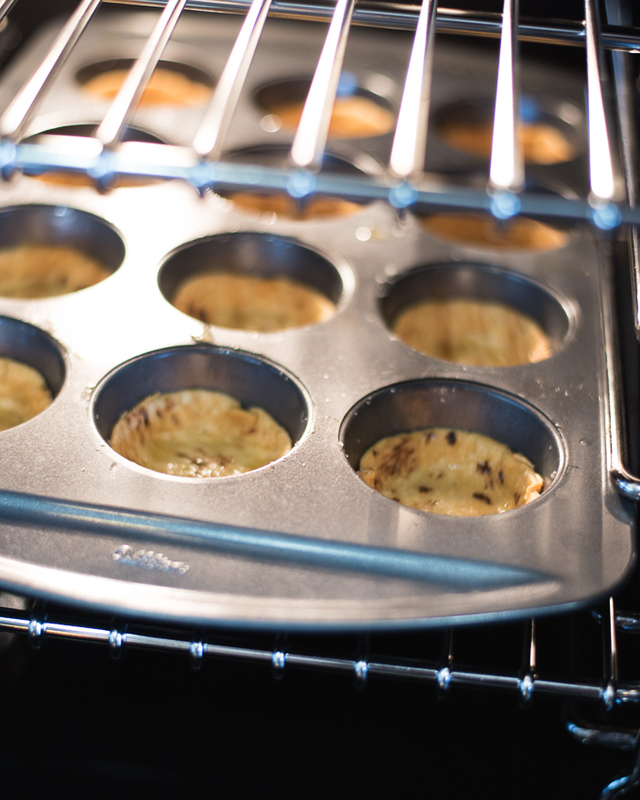 Make sure that they’re rigid; cracker-like but not burned after the first bake. Then, add in the filling, and bake again at 350°F until just set. Allow these delights to cool before cutting them, taking them out of the pan, and dusting with powdered sugar. 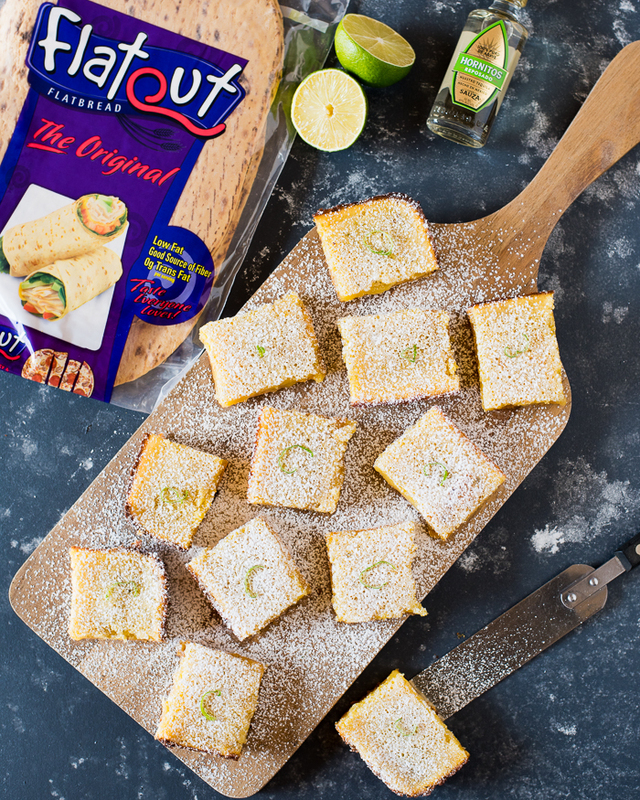 Add some lime-rind curls on top, so people know you’ve got something different up your sleeve. If you want to get the party started right away, serve with tequila shots. Yeah, boieeee! 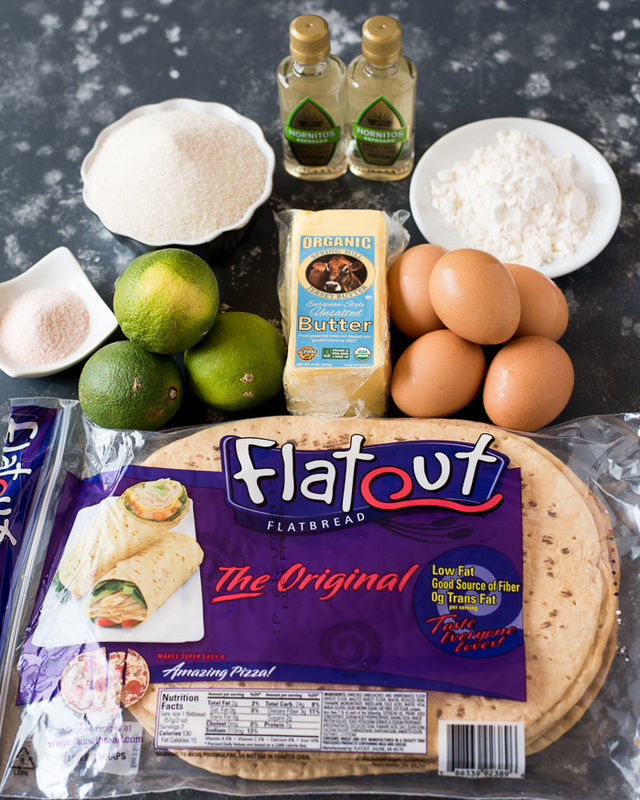 My local grocer carries Flatout® Flatbreads, and yours probably does too, but just in case you don’t want to make any un-necessary trips, they do have a handy-dandy locator. You’re covered. Boom! 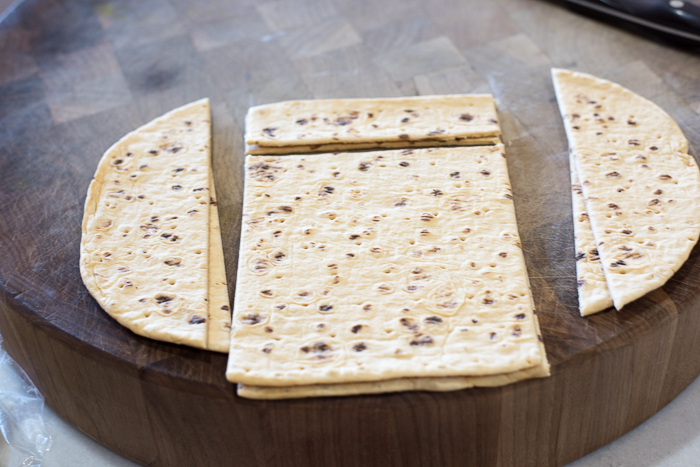 You’re going to have some of the Flatout® Flatbreads left over no doubt, but I know you’ll find uses for them. Just yesterday, the hubbs and I got down on some quick and healthy bean and cheese wraps while we watched our normal Sunday Programming. They’re tremendous for both sweet or savory applications. 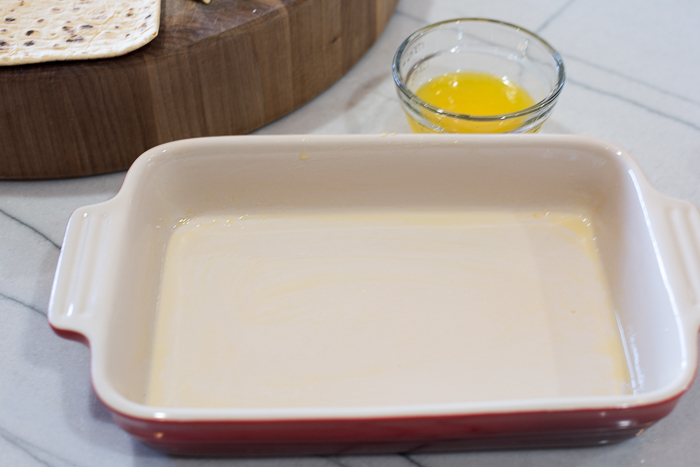 Cut your flatbreads into largest possible squares, and paint with the melted butter. 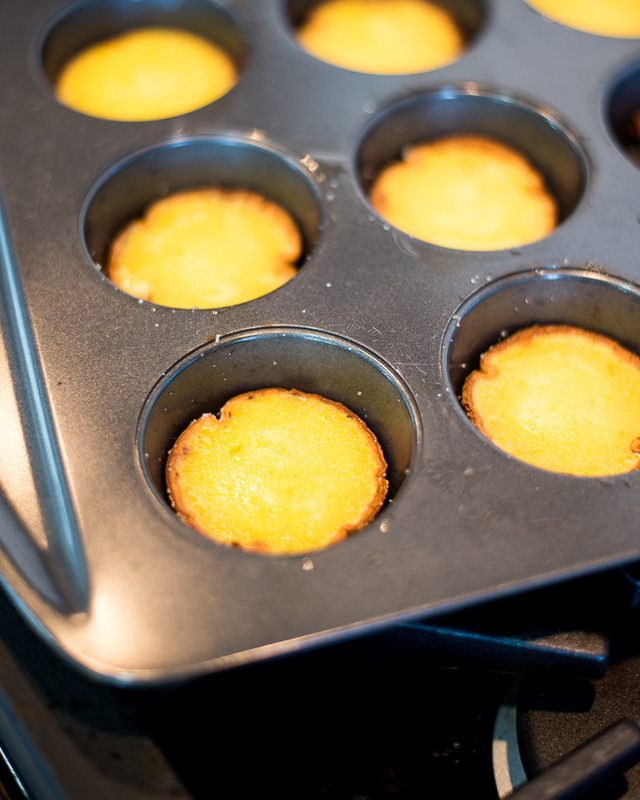 Arrange them in an even layer, not overlapping, in the pan, cutting them as necessary to fit the pan. Make sure to have them come up the sides of the pan by about a quarter of an inch. Repeat, making a second layer, covering the seams in the first layer the best you can. 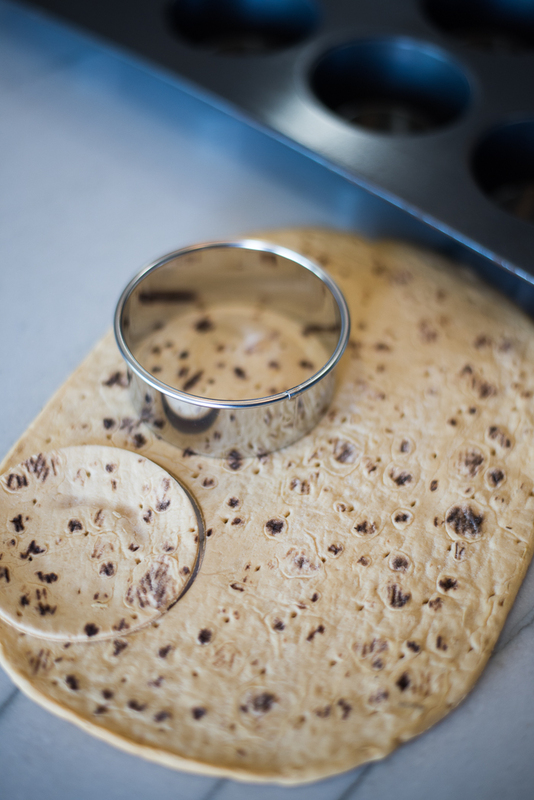 *For individual tarts: Cut 3″ rounds out of the flat breads with a biscuit cutter, sprinkle the bottom of the rounds with sugar, and press into cupcake pans. Do not double the crust on these. Use the same method, baking at 400°F until golden brown, allow to cool, fill with filling, and bake for 8 minutes more until set. Disclaimer*: This post was sponsored by Flatout®, and I was compensated for this recipe and post. All opinions are completely, 100% my own. I love the muffin version, so clever. You could never go wrong with lime and tequila in my book! Pair with Avery fortuna – barrel no 28 ! I can’t wait to try to make this. Thanks !! Oh snap, had to look that up, Arnie! Sounds like it would pair beautifully given that it’s a sour ale that is aged in Tequila barrels with lime zest and salt. Perfection. Thanks for the tip!